Listings information from the Little Theatre, Bath, for a forthcoming fundraising event. 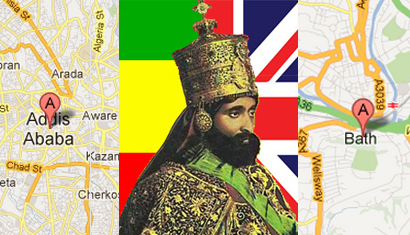 Documentary presented by Benjamin Zephaniah, charting the extraordinary time Ethiopian Emperor Haile Selassie I spent living in the city of Bath, 1936 – 1941. Featuring interviews with Bath residents who met him, worked for him and who hold the Emperor in high regard today, the film covers the special place Bath had in the heart of the Emperor and examines his legacy, including Fairfield House, the residence he left as a gift for the city. The screening will have a special resonance at the Little, where it will be showing in the very same auditorium in which Haile Selassie used to watch newsreels. We are very honoured to have with us the director Shawn Sobers, who will take questions from the audience after the film. Showing in aid of the trust that runs Fairfield House, the home of BEMSCA (Bath Ethnic Minority Senior Citizens Association).